Faith had an orthopedic visit this morning (again, refer back to my regular blog for the details, short story is she has 2 broken legs & a broken arm because she fell over our second floor balcony). The 8:45 appt ended up getting us home around noon, so I had to throw together a quick little bento lunch/snack for Mr. Ben, then head right back out to preschool. Thankfully, I have been to the grocery store as of late and had some food options! 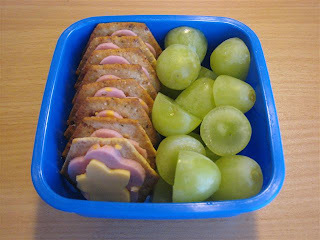 Mr. Ben had some ham and cheese flowers on veggie crackers and sliced green grapes. I was very happy to find grapes for only $2/lb, so we were finally able to get some. As much as F&B love grapes, I have trouble paying $3+ per lb. Ben was quite happy with his snack and told me that he likes the little lunches but he needed a treat to go with it. ;o) I promised him we'd make some mini-muffins or cupcakes this week. Do you order any of your supplies online? There aren't any asian stores close to me, so I am trying to find the best place online. Oh, I hope your daughter heals quickly! Poor thing. I've seen a couple times in your blog that you pack cheese and crackers together, whenever i do this my crackers get horribly soggy! What do you do to yours to keep them from losing all their crunchiness? Sorry, just noticing old comments. Crackers only get added to bentos that are eaten quickly. Ben went to preschool from 1 - 3:30pm, so if I made his snack right before we left, we didn't have soggy problems. If the kids are gone longer, I put crackers in a separate little container. Fruit picks are from all sorts of places. My favorites are from Japanese stores, but Wilton cupcake picks do work pretty well. The Dollar Tree occasionally has cute cupcake picks too. Pretty much any cute toothpick like item will work!